Shakertown Craftsman, Cedar Cove and Colonial | International Wood Products, LLC. Looking to increase curb appeal? Look no further than the genuine, natural color and grain of Shakertown® products, offering a great cedar siding solution for any new or remodel project. 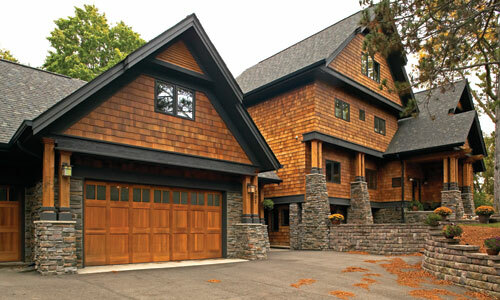 Cedar adds dimension and drama to a home’s exterior. Shakertown offers a variety of products to add to that dimension. Individual sidewall shingles, fancy cut patterns, and pre-manufactured Craftsman or Cedar Cove shingle panels. Whichever option you select, cedar siding offers classic beauty to outlive trends in style and natural resistive properties to outlast other building materials! When properly maintained, cedar is renowned for its inherent resistance to the effects of sun, rain, pests, and time. Along with being beautiful and durable, Shakertown® Craftsman Cedar Shingle Panels can reduce labor and waste as well.